Every Friday, Caesars Windsor’s signature restaurant, Neros Steakhouse, is bringing dining adventurers around the globe with an upscale worldly, “Indulge in the Tastes of the World” menu highlighting flavours from a variety of exotic cuisines. October is the perfect month to highlight Germany’s hearty flavours with a plentiful platter of tasty delights. This expertly crafted menu includes three courses for two, beginning with your choice of soup or salad followed by an entrée of lightly breaded Dusseldorf veal, pan seared pork tenderloin, new crop potatoes, classic grilled bratwurst with house made sauerkraut and beer mustard. Finish off this meal with a just-sweet-enough Quark Torte dessert with Chantilly Cream and Grated Chocolate and Raspberry Puree. View the menu for a full description of the dishes. Be sure to ask your server to suggest a perfect pairing from Neros incredible wine cellar or a variety of beers on tap. Servings are served on a sharing platter for two. 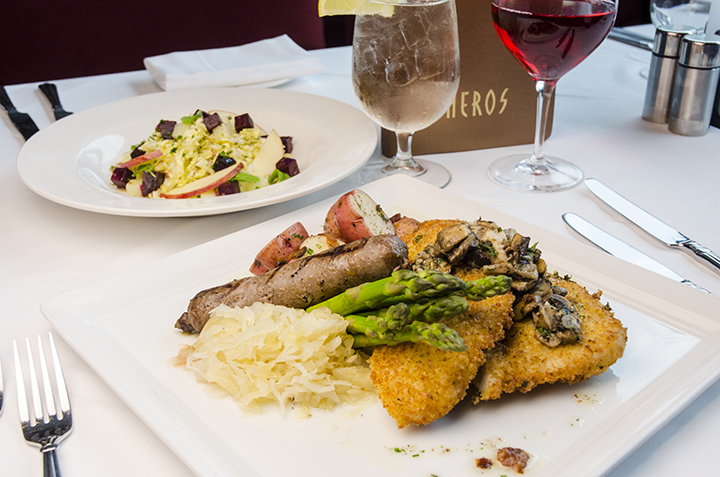 Each month, a new “Tastes of the World” will be featured in Neros on Fridays. In November, try out the Argentinian inspired offering. The cost is $99 plus tax for two. The award-winning Neros is truly a special night-out, upscale experience with complimentary valet at the Riverside Entrance. The spectacular views of the riverfront and service are also highlights.